The Newsteo wireless sensors used by Soldata at the Strasbourg civil hospital. 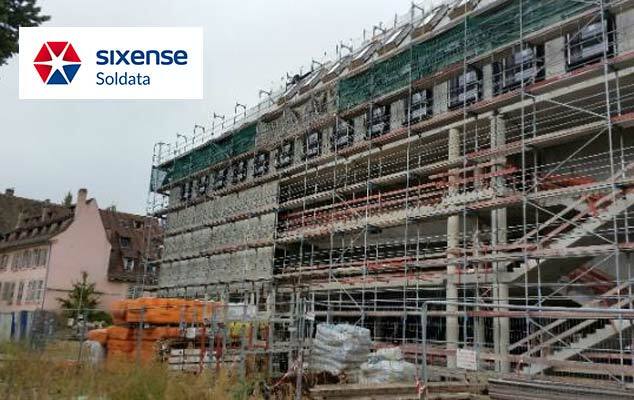 During the construction of the building intended to house the Strasbourg Public Administration and the Center for Intellectual Property within the site of the Strasbourg Civil Hospital, the appearance of defects on the concrete structure caused work interruption. Since consolidation operations were necessary, Soldata was mandated alongside Freyssinet in order to help ensure the safety of the workers working on the site by installing a system of auscultation of structure in order to prevent abnormal movements and to alert, via an alarm system, persons working on site. In view of the size of the building, Soldata chose the deployment of a wireless data recovery system. The MicronsTM thus connects 13 extensometers, 16 strain gauges, a fissurometer, a pressure cell, a temperature sensor and two tiltmeters to an autonomous gateway (powered by a solar panel), allowing a complete auscultation of the building in real time.